My LIfe as the "Soap Lady": Got Goat Milk? I used to work with the children that were involved in 4H, but alas I've been doing this long enough that the children have now grown up and gotten out of the "goat biz". Then I got the milk from a very nice lady that raised the goat for her children that had issues with cow's milk. I am in awe that she did that for her children, what an awesome mom! 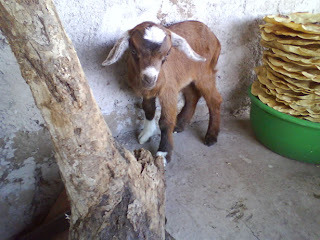 But She had to let her goat dry out due to some health issues the goat was having (she's OK, don't worry). So, I was having to get the Goat Milk from Raleys, or as I just found out, Trader Joes also carries it. It's quite expensive and the thing is that I SO prefer it straight outta the goat! So, I am meeting with a lady in Brentwood this week to see if she may be my new supplier, I am so exited! The picture by the way is of a general goat, not THE goat! Woo hoo!